There is nothing like cooking or 'baking' with fresh 'herbs', but if you live in an apartment perched high above the city, you probably don't have room for a garden. Unless you can find space for Peter Buley's kitchen island which hides a secret hydroponics garden. 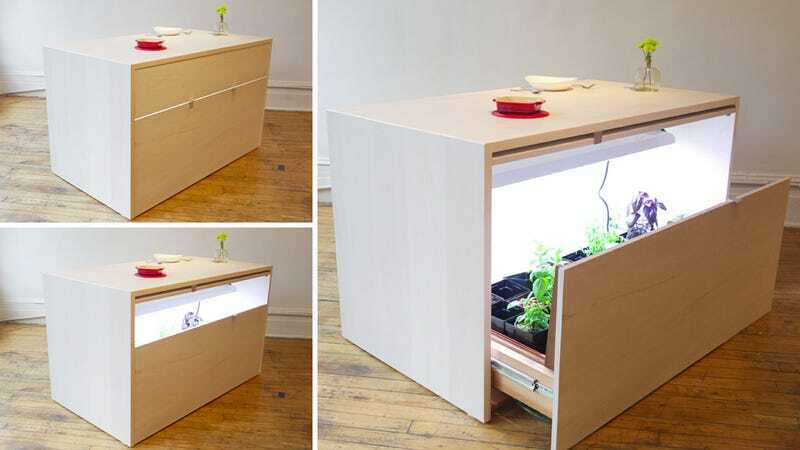 Inside its lovely white-washed maple exterior you'll find a set of stand alone "ebb and flow" hydroponics systems accesible via a cedar drawer system. And since the sun don't shine inside, a pair of LED and a pair of high output CFL bulbs ensure the plants get plenty of light. There's no word on pricing, but Buley is happy to create a custom island upon request. For anyone who maybe wants to turn their small herb garden into a business of some sort.